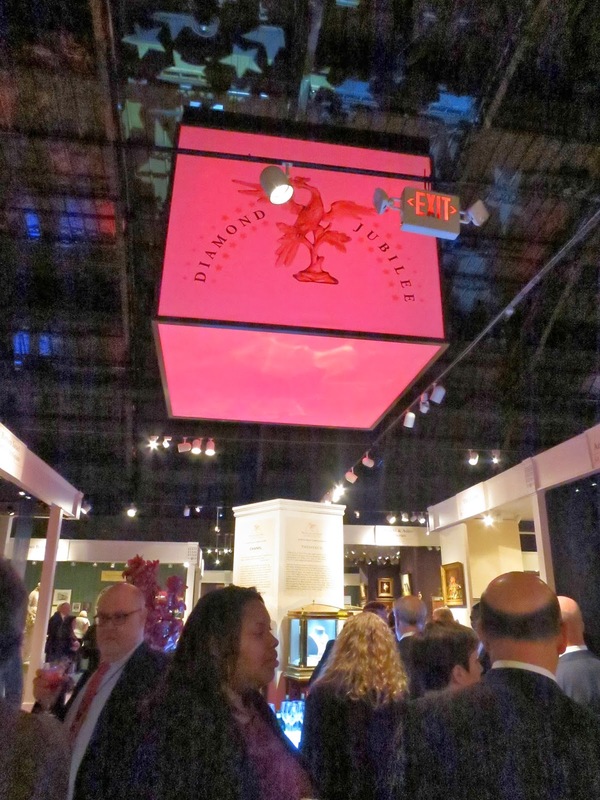 This past Thursday Boy and I attended the opening party for the Winter Antiques Show ("WAS"), held at New York's Seventh Regiment Armory on Park Avenue on Manhattan's Upper East Side. 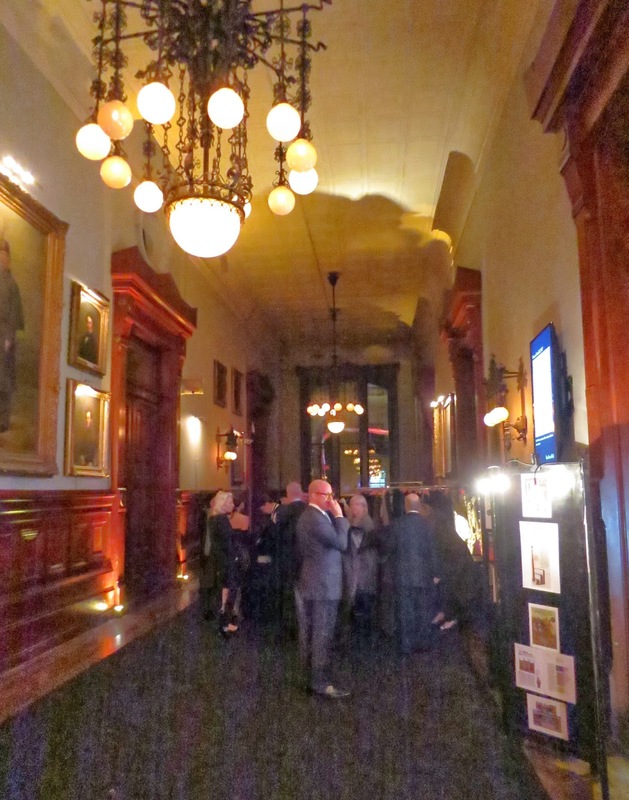 The WAS opening party is one of the highlights of the New York social season and attracts a large crowd of sleek and moneyed New Yorkers. 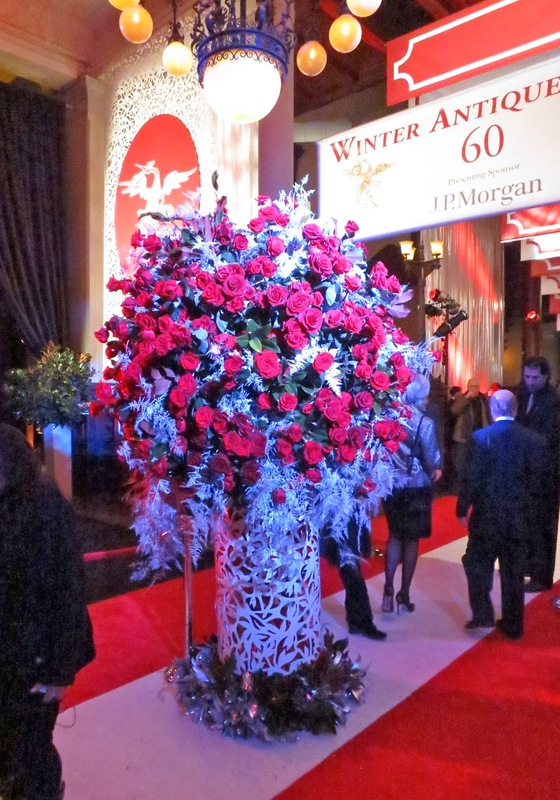 This year marked the show's sixtieth anniversary. 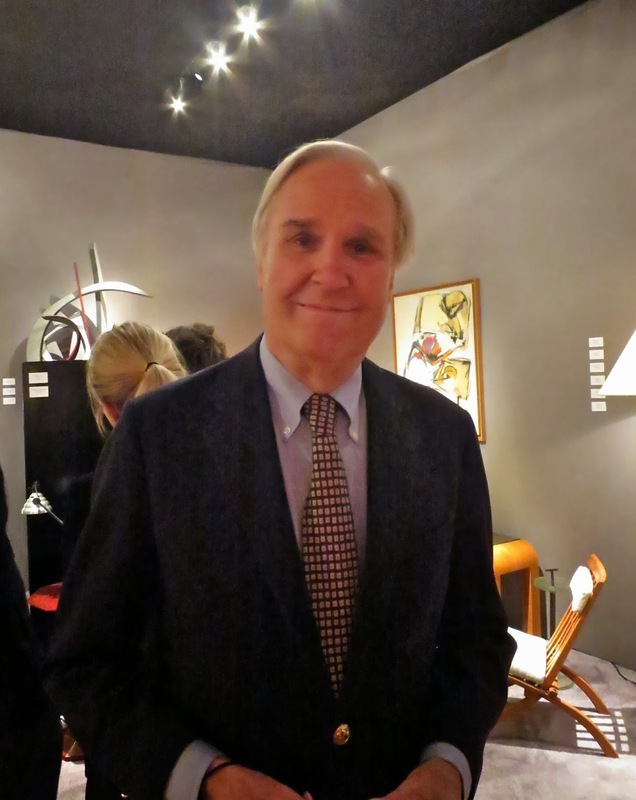 It's one of the longest running and most prestigious antiques show in the country, Dear Reader. so Reggie didn't have to wait for a cocktail! The WAS opening party is a lot of fun. One can spend the entire evening boozing and schmoozing, as there are food and drink stations at every turn, and one runs into all sorts of people one knows—or would like to know better. 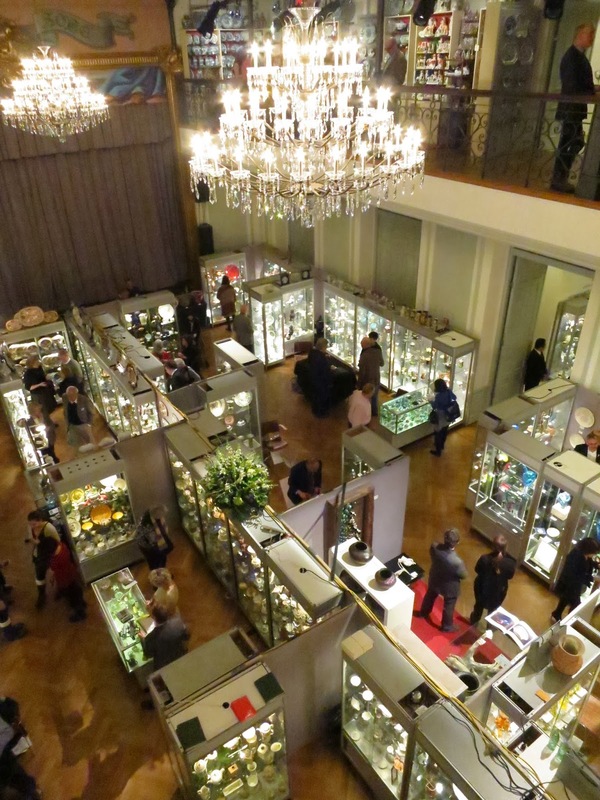 Every year the WAS hosts a loan exhibition from a noteworthy cultural institution. This year's show features one from the Peabody Essex Museum in Salem, Massachusetts, also known as "the PEM." The PEM's exhibition was designed by Mr. Jeff Daly, the former Chief of Design at the Metropolitan Museum of Art, who now has his own museum and design consulting company. I was very pleased to meet and speak with Mr. Daly and his partner at the party, both of whom I learned are sometime readers of this blog! The PEM has a number of masterpieces from its collections on display. 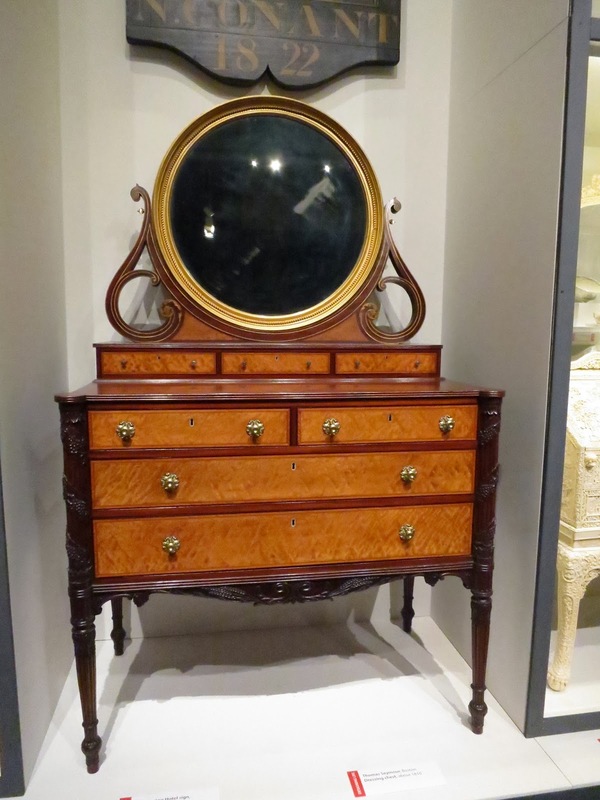 Prominently (and rightly) featured is this dressing table by the cabinet makers John and Thomas Seymour of Boston, made for Mrs. Elizabeth Derby West, the daughter of the immensely rich Mr. Elias Haskell Derby. Boy and I attended the landmark Seymour exhibition that the PEM mounted ten years ago. I shall never forget it. It was spectacular. 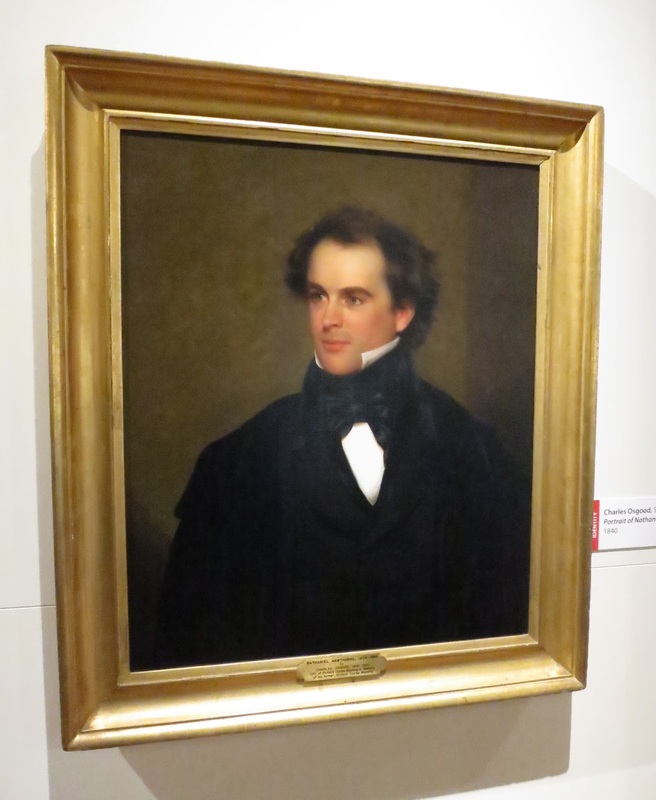 Also displayed is this portrait of a young and handsome Nathaniel Hawthorne in the PEM's collection. I have a postcard of this portrait, bought at the PEM when we toured the Seymour exhibit, that I have slipped into the frame of a mirror hanging above my chest of drawers at Darlington. One of the first people I ran into at the show was Mr. David Patrick Columbia, of New York Social Diary fame. I am a devoted reader of and sometime contributor to NYSD, and I owe Mr. Columbia a story that I've been working on for him some time now. We had a pleasant conversation, and the picture he took of us appeared in his next morning's post. Thank you, sir! Pork, vegetable, chicken or beef? 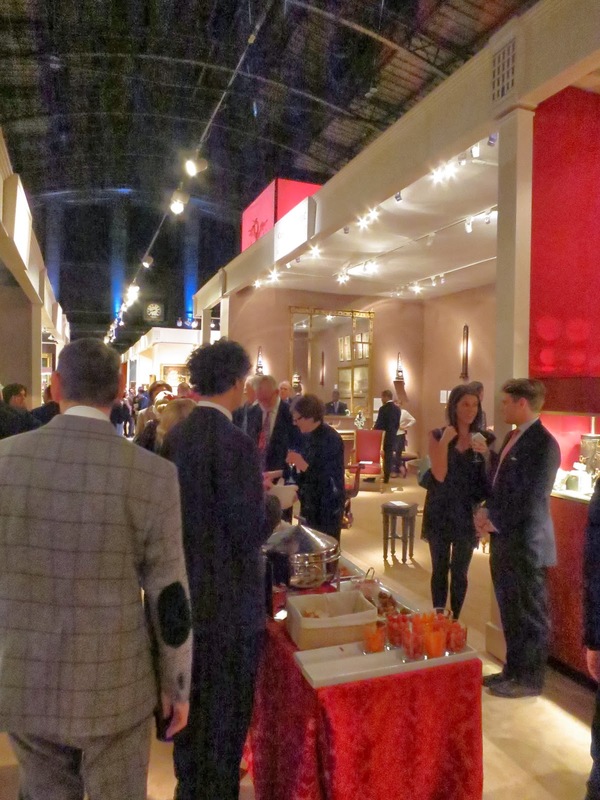 The food offered at the Winter Antiques Show this year was delicious and varied. The dumpling station shown in the preceding photograph was very popular. 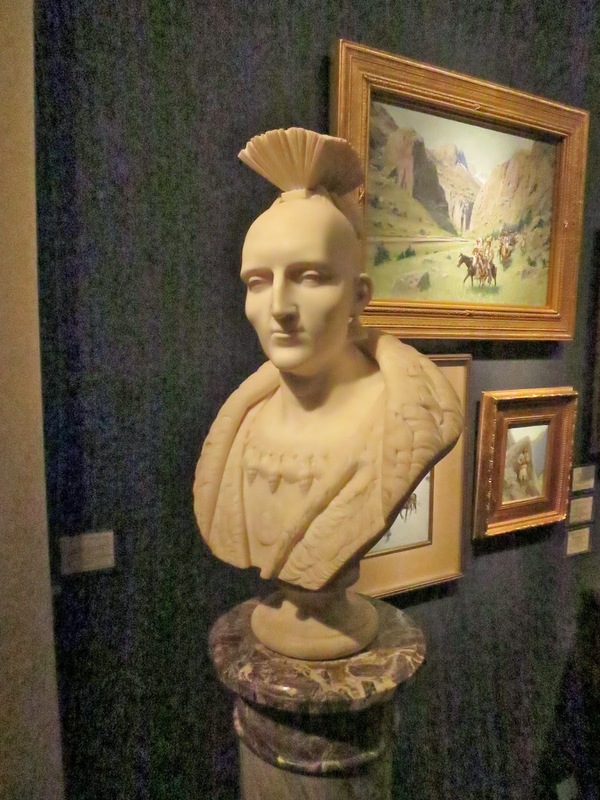 I stopped in my tracks when I turned around and noticed this exotic-looking mid-nineteenth-century marble bust of an American Indian. 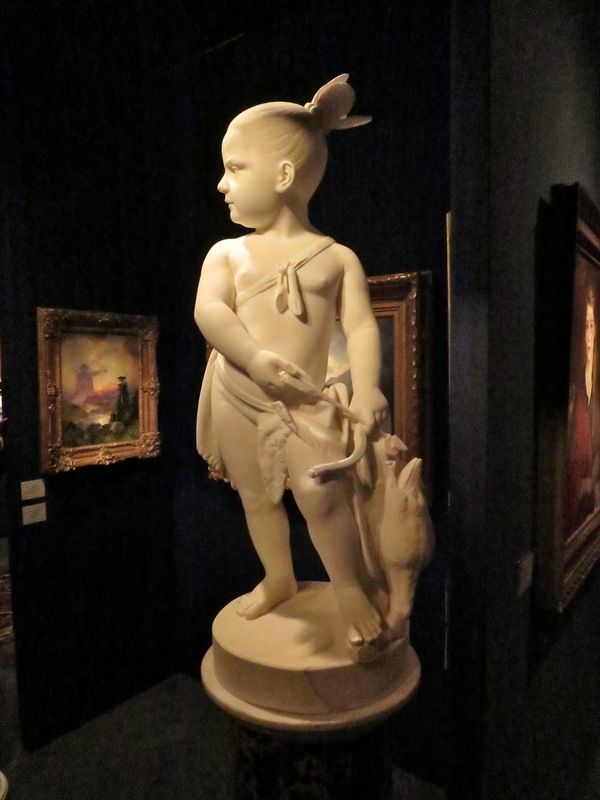 And I was also quite taken by this full-length statue of a young Indian by the same sculptor, in the same booth. 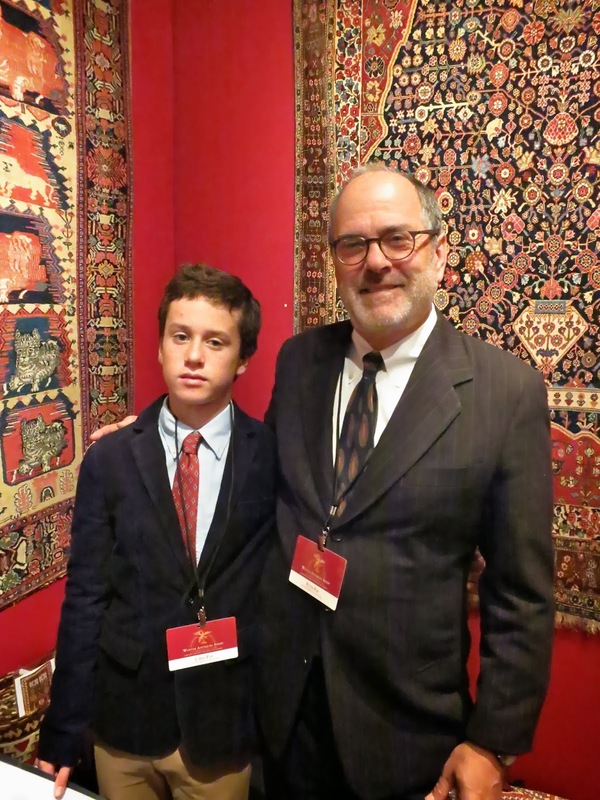 My next stop was to say hello to Mr. Peter Pap, the San Francisco-based dealer of oriental rugs. Mr. Pap's mother and mine were great pals when we were both lads, and we share a mutual friend in common today in Mr. Guy "Pickles" Gurquin, the noted San Francisco decorator. Mr. Pap was joined at the party by his son, Master Jared Pap, whom I enjoyed meeting. I'm afraid the younger Pap may have thought me one of those "I knew your grandmother . . ." old fogey blowhards, but he seemed pretty game about it. 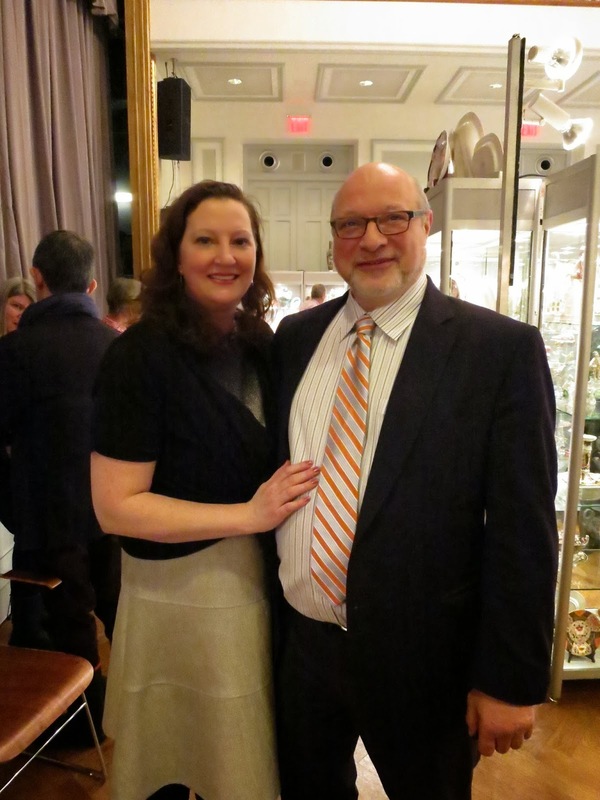 We next peeked into the booth of the Old Print Shop, where we admired an early depiction of Alexander Hamilton . . .
. . . and then made a beeline to the booth of Stephen and Carol Huber, America's preeminent dealers in antique schoolgirl needleworks. Who should I then run into next but Mr. Michael Henry Adams, man about town and bon vivant! Mr. Adams has kindly invited me to spend a day with him taking in the noteworthy historical sites in Harlem, and I look forward to doing so soon. Taking my leave of him, I briefly paused to admire this pulchritudinous ancient statue . . .
. . . on my way to the back bar to replenish my flute of champagne. 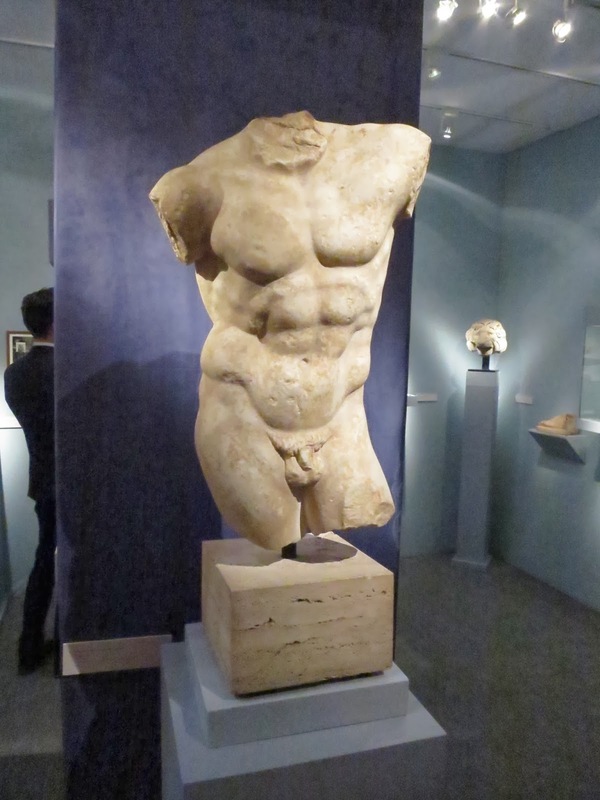 A number of my Dear Readers may remember another, also pulchritudinous ancient statue, that I featured in my last year's post on the WAS opening party, shot from the—ahem—rear. It was also from the same dealer, Safani Gallery. I needed a refreshment of champagne in order to bear the excitement of the prospect of next visiting the booth of Hirschl & Adler, where I found Boy shamelessly flirting with the lovely and fun Ms. Liz Feld. And why not? Ms. Feld is divine, and we like her and her family immensely. 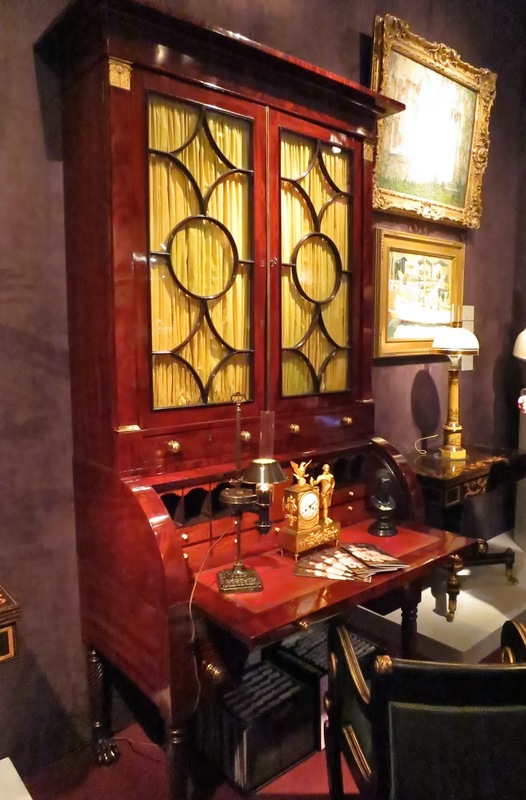 The Felds have the most mouthwatering goods on display in the Hirschl & Adler booth at the WAS, including this spectacular desk attributed to Duncan Phyfe, shown in the following photograph. They also had—not one, but two—George Washington clocks on display. It almost made me faint! 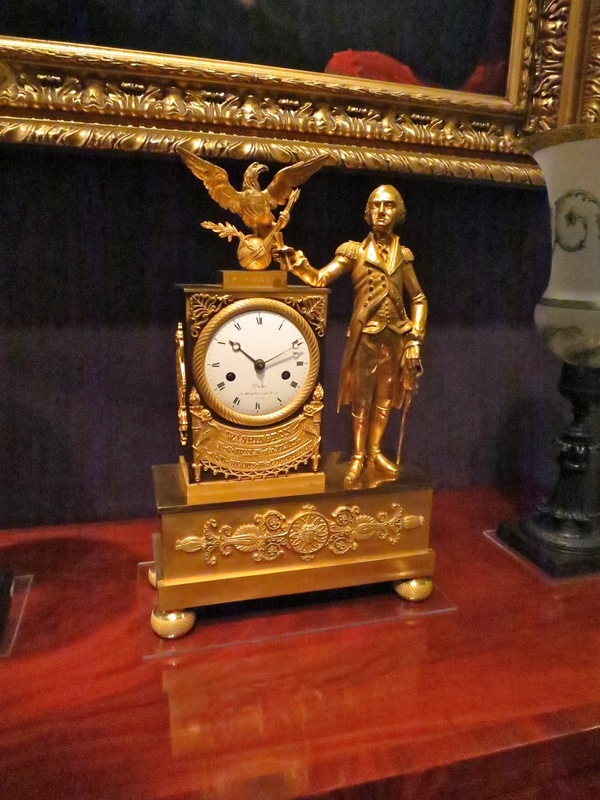 Another gilt bronze George Washington clock! I immediately needed another glass of champagne in order to collect myself. Fortunately there was a bar set up close at hand for just such an emergency. Our next stop was the booth of Jeffrey Tillou Antiques, of Litchfield, Connecticut. We have been customers of Mr. Tillou, both at the WAS and his Litchfield shop, ever since we bought Darlington. I was quite taken by this large, early-nineteenth-century still life painting in the Tillou booth. "Let me tell you about where I found this painting . . . "
Boy briefly considered this small landscape. 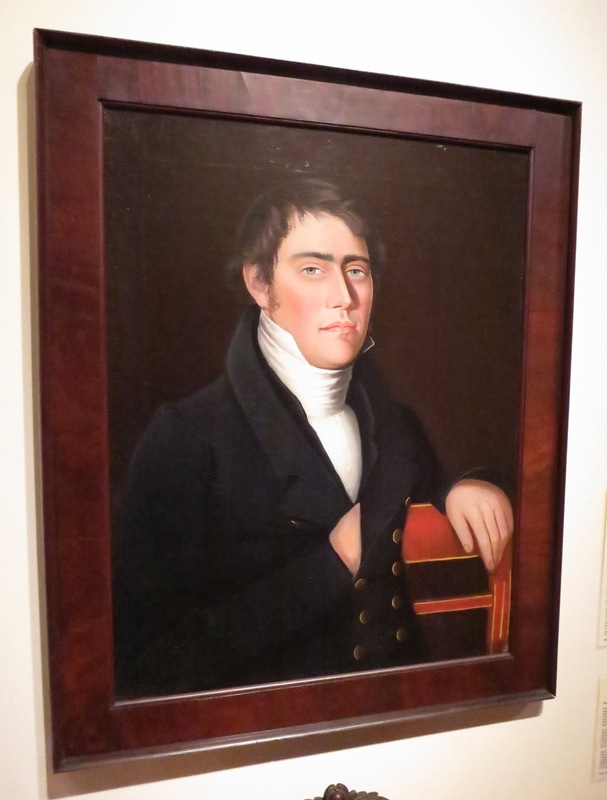 And we both liked this Ammi Phillips portrait in the Tillou booth of a rather haughty young gentleman. I thought it one of the better portraits by the artist that I've seen in recent years. It was already—not surprisingly—sold. Leaving the Tillou booth we stopped and chatted with Ms. Mary Dohne, seen on the right of the preceding photograph. Ms. Dohne works at Liz O'Brien, a dealer in exquisite, sophisticated, bench-made mid-century furniture of the Maison Jansen/Samuel Marx/Francis Elkins school(s). Ms. Dohne is really rather jolly. I loved the outfit she was wearing at the party. We then made our way to the Liz O'Brien booth, where we stopped and chatted with the charming and gracious Ms. O'Brien. I've admired Ms. O'Brien's eye for many years, starting from when she first had a shop in SoHo. Ms. O'Brien is shown in the preceding photograph standing next to a commode made by Maison Jansen for the Duchess of Windsor. It was exquisite. I am tickled pink that Ms. O'Brien and I are now Facebook friends. I'll have one of everything, please! Taking a break from the visual overload, I fortified myself with several helpings of tasty Peking Duck rolls at the nearby food station. I next stopped into the booth of Cohen and Cohen of Reigate, England, to admire their magnificent offerings of (positively) ducal Chinese export porcelain. 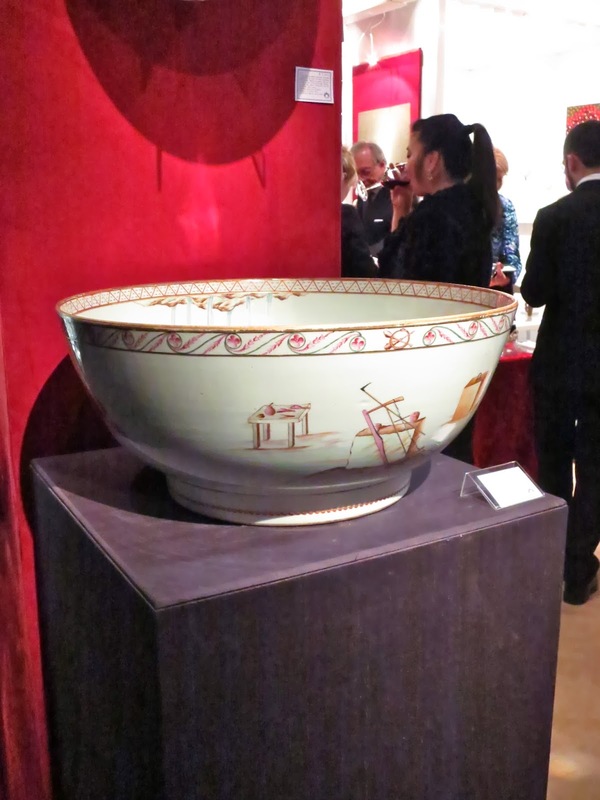 Mr. Will Motley was kind enough to show me the heart-stopping punch bowl Cohen and Cohen had on display that was (thought to be) commissioned by States Morris Dyckman (1755-1806), ca. 1805, for his house, Boscobel, in the Hudson River Valley. 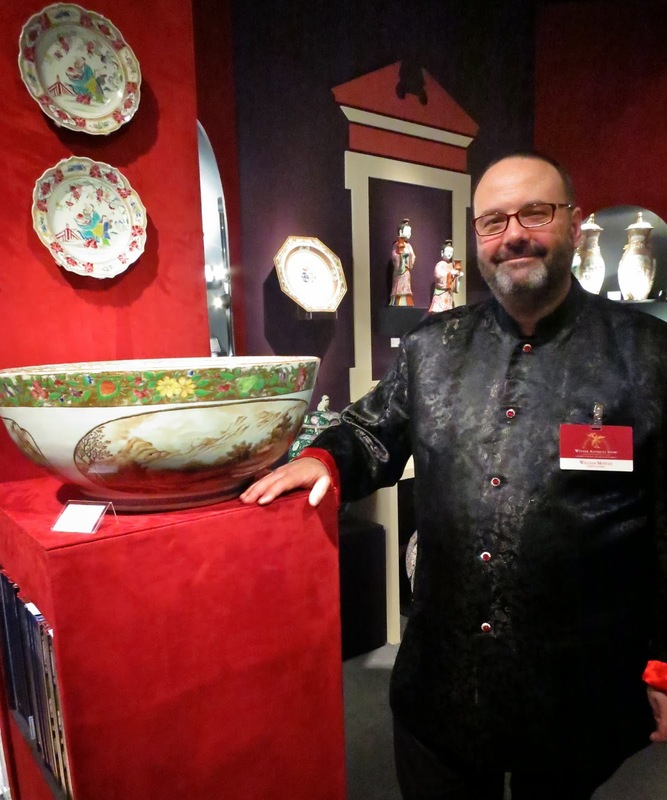 Unlike the rather foul-humored dealer at the Ceramics Fair who wouldn't give Reggie the time of day, Mr. Motley was more than pleased to let me examine a truly superb Chinese export punch bowl, ca. 1800, decorated with Masonic emblems. It was large enough to bathe an infant! Our next stop was to visit the extremely popular Cove Landing booth. 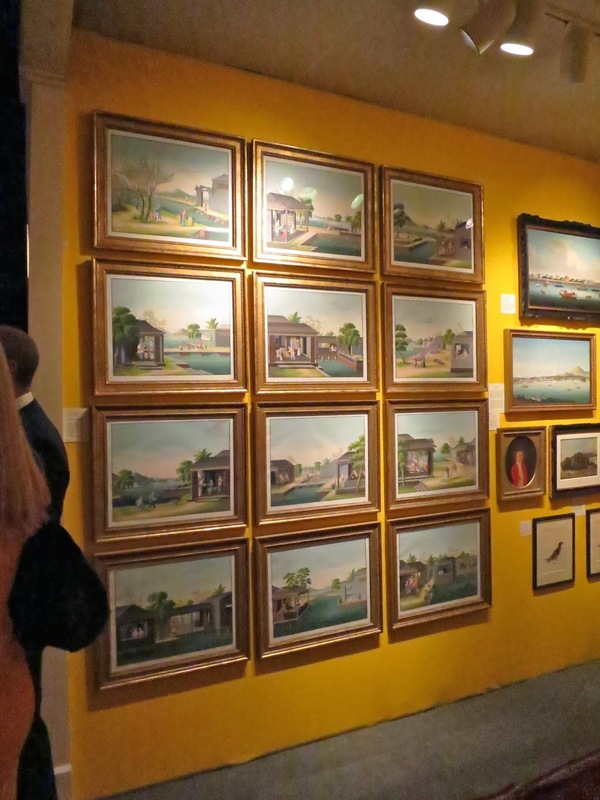 I did a post about attending an exhibition sale at Cove Landing this past fall. We've become rather addicted to Cove Landings' exquisite offerings, Dear Reader. Across the aisle from Cove Landing, I was entranced by this impressive suite of watercolors of the stages of operations of a silk factory in China, from the early nineteenth century. Not everything at the WAS dates from pre-1900. The dealer's booth shown in the preceding photograph was positively brimming with the wildly collectible, wildly expensive mid-century furniture made by the Japanese-American cabinetmaker and architect George Nakashima (1905-1990). Not all the "nudies" at the WAS were from the Ancient era, Dear Reader. I was quite taken by this early-nineteenth-century pinup in all her unclothed glory. Which inspired Reggie with yet more of an appetite for the party's tasty finger food. I always make sure to stop at the Carlton Hobbs booth at the WAS. He has magnificent things to ogle, including this show's truly fantastical pair of enormous Adam-style mirrors (although I suspect the English Mr. Hobbs prefers to call them "looking glasses"). Yet more food was to be had. And yet another photograph of another beautiful booth at the show. "Be it ever so humble . . . "
I thought the grisaille wallpaper at Kentshire Galleries, seen in the preceding photograph, was beyond sublime. 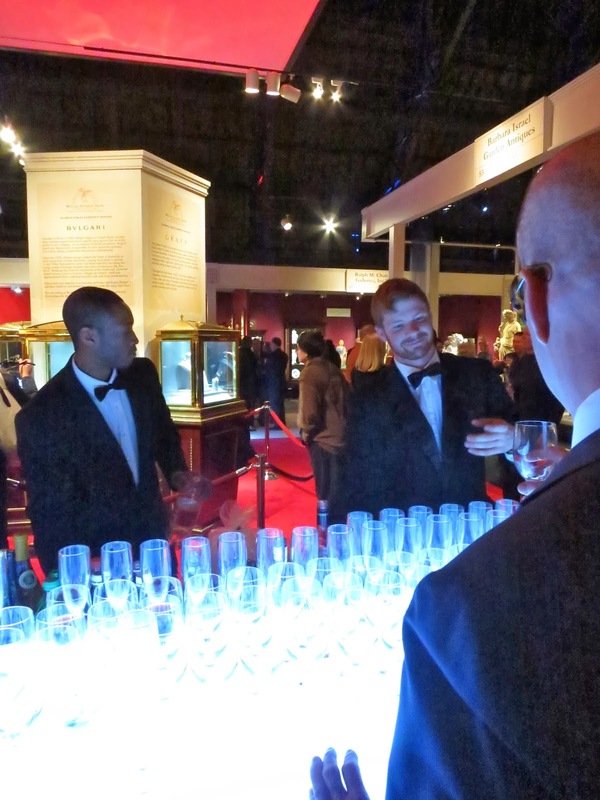 Another photograph snapped of yet more benefitters milling about the drinks station at the center of the Armory. Is that Miss Miller Gaffney I see in the Maison Gerard booth? 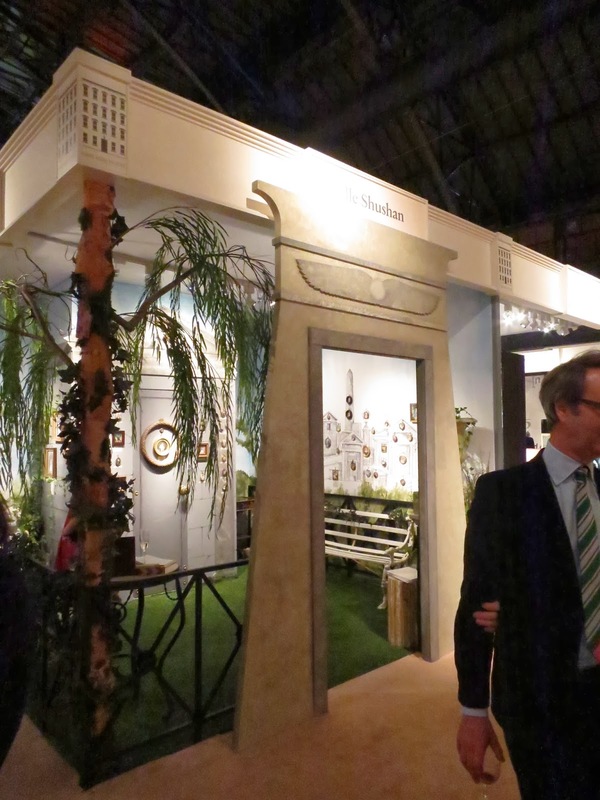 The Maison Gerard booth was very chic, I thought. 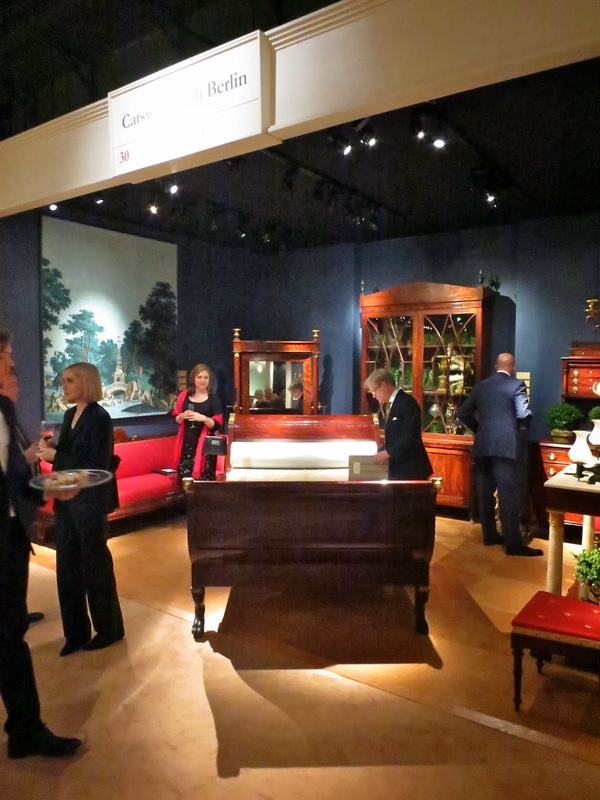 And the Carswell Rush Berlin booth of American Classical furniture was definitely worth a gander! I particularly liked the bookcase along the wall. I wish I had a place for it at Darlington House. 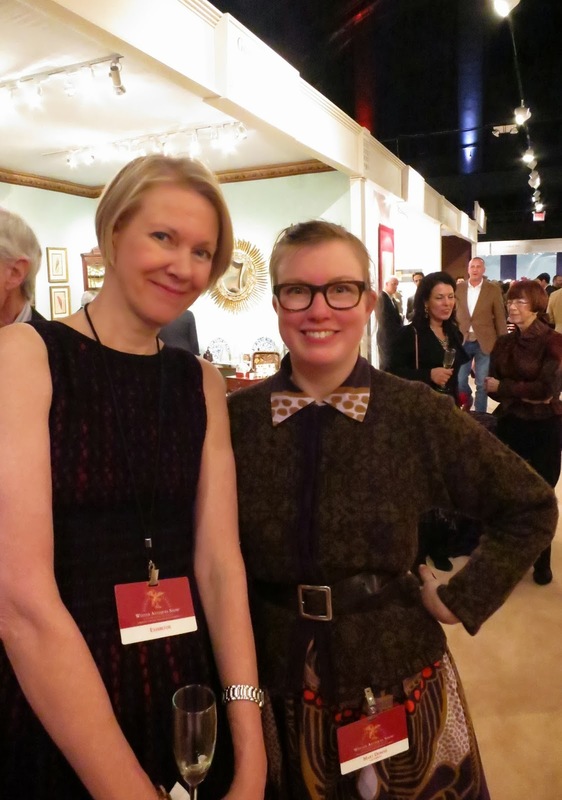 Our final stop at the show was the always-marvelous booth of Elle Shushan, the best American dealer in fine antique miniature portraits. 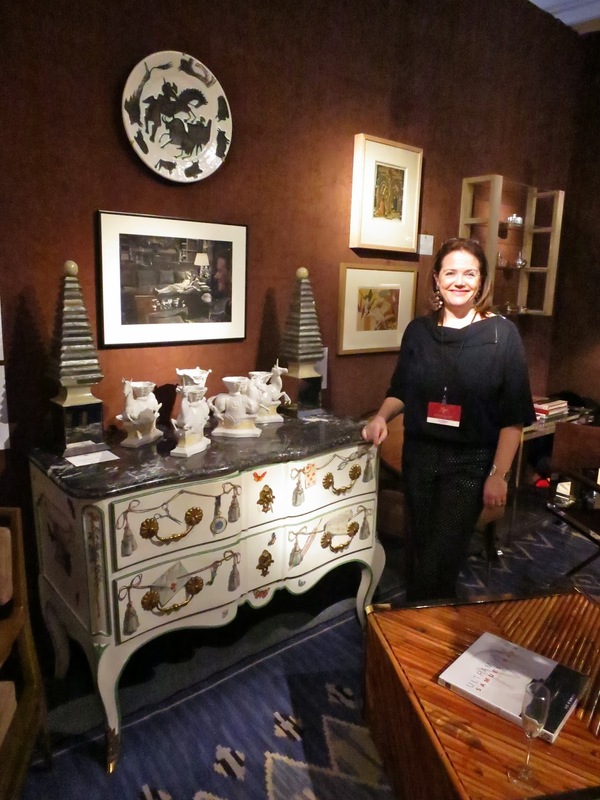 Every year she and her friend, the designer Ralph Harvard, come up with a different inspiration for her booth's design. I think this year it may have been the Egyptian-revival architecture of Henry Austin (1804-1891), but I could be mistaken. With dinner plans beckoning us at the nearby L'Absinthe Brasserie, and the delightful company of Ms. Maureen Footer and Ms. Emily Evans Eerdmans to look forward to, Boy and I then retrieved our coats and made our way out the main door of the Armory and into the chilly January night. And just like that, we were gone! 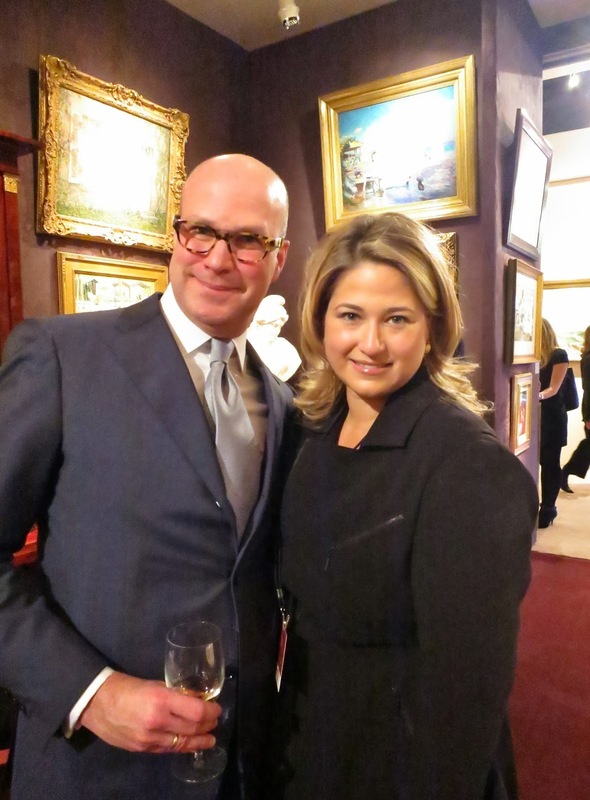 Tuesday evening marked the official beginning of the 2014 New York Antiques Week with the opening party of the New York Ceramics Fair and the arrival of a massive snowstorm that brought the city to a standstill. 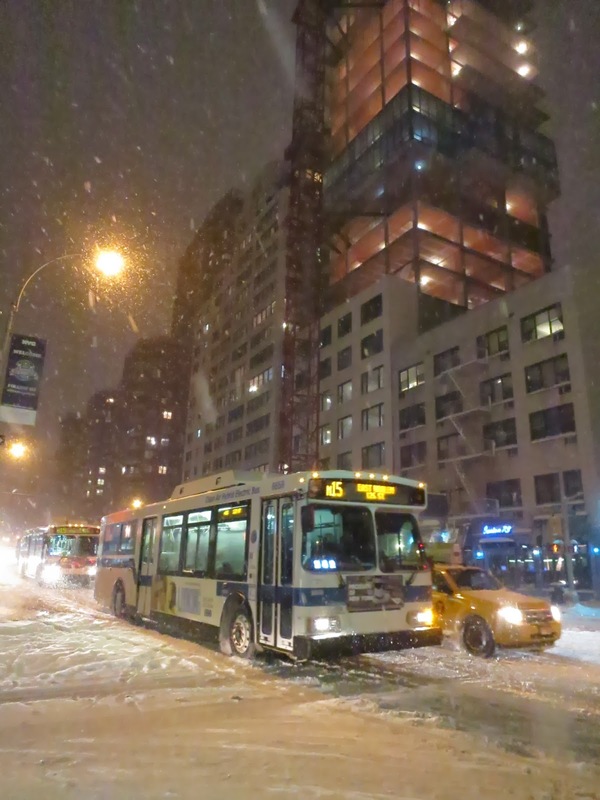 Not an auspicious start for Antiques Week or the Ceramics Fair, I would posit, as the show's dealers and the opening's attendees both struggled to navigate the city's treacherous streets, with weather forecasters predicting up to a foot of snow in Manhattan overnight. 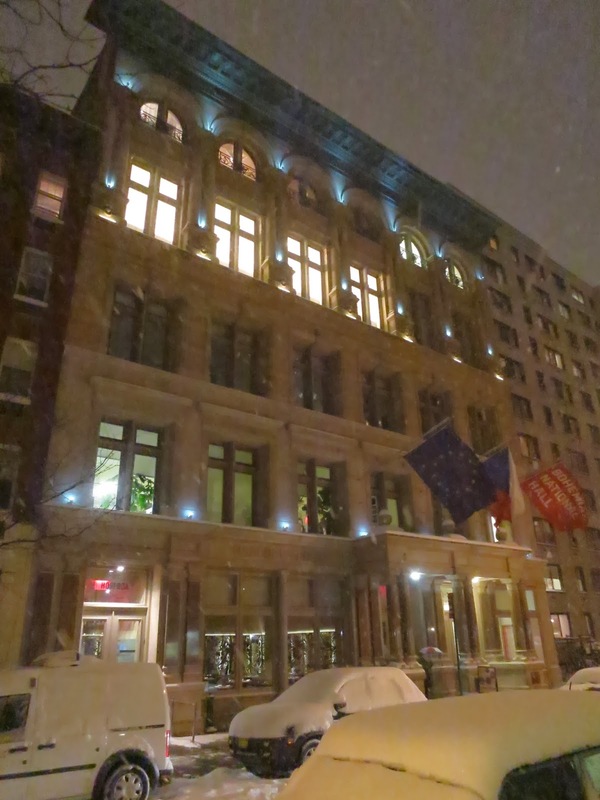 By the time I made it to the Bohemian National Hall on 73rd Street, the venue for the New York Ceramics Fair, there was already a heavy blanket of snow on the ground, and the temperature had dropped into the mid-teens, and was heading further south. 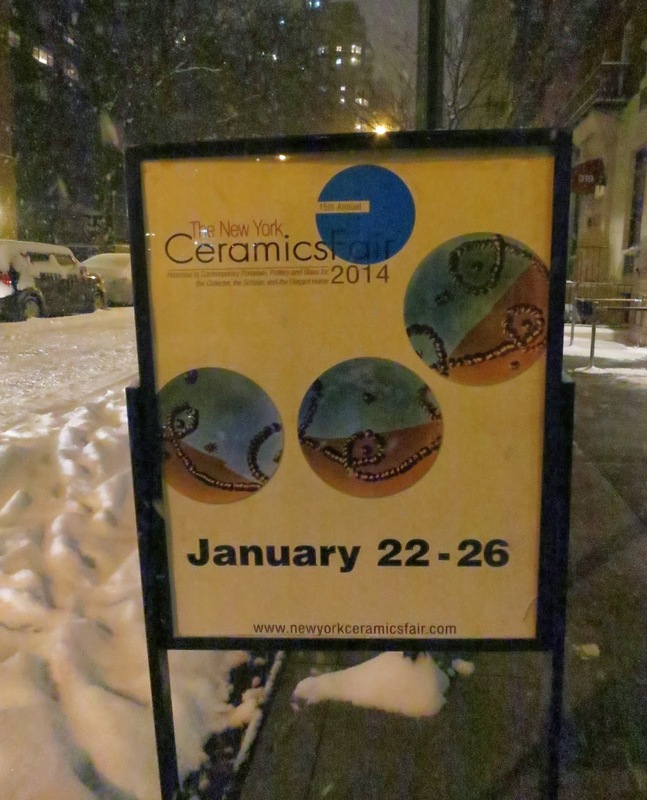 A little bit of snow was not about to keep Reggie from attending the Ceramics Fair's opening party, Dear Reader. Not on your tin-type! Reggie wouldn't miss the Ceramics Fair (one of the highlights of Antiques Week, in his view) for the world. 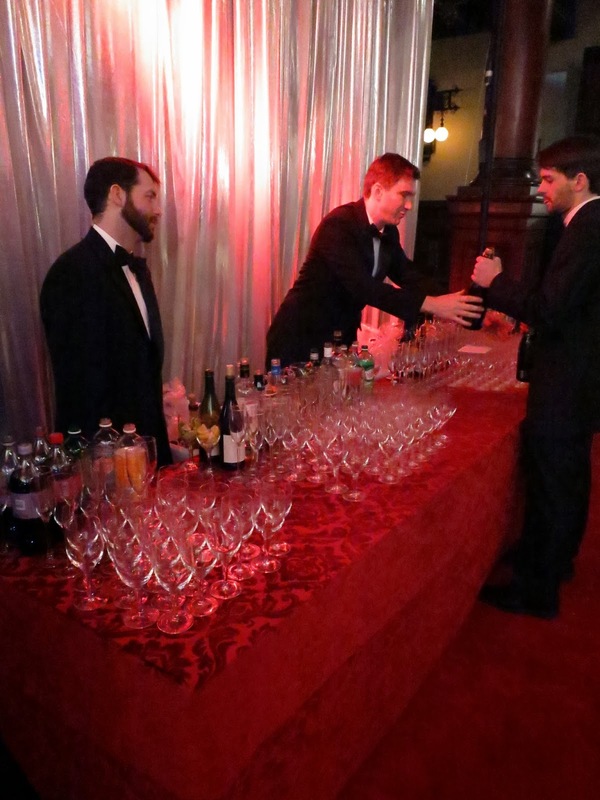 After depositing my coat and hat with the coat check, my first destination was the party's open bar, where I fortified myself with a glass of champagne and marched into the Bohemian Hall's concert hall, where the dealers were set up. 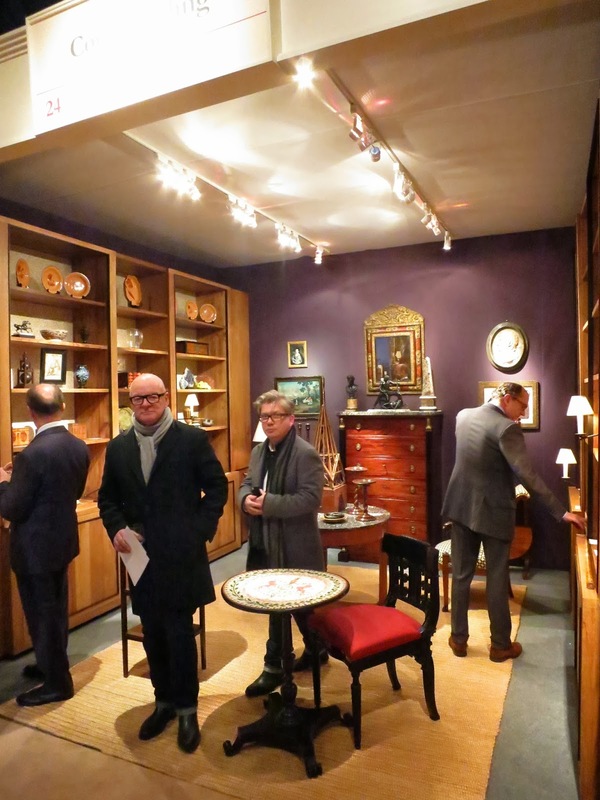 I made a bee-line to the booth of Earle D. Vandekar of Knightsbridge, where I thanked Mr. and Mrs. Paul Vandekar, shown in the preceding photograph, for inviting Boy and me to the opening party, as their guests. The Vandekar's always have a tasty selection of pretty porcelains and ceramics on display, and we've bought pieces from the over the years for our collection at Darlington House. I was quite taken with this early pearlware Staffordshire pair of recumbent figures of Cleopatra and Anthony, ca. 1815. I've admired similar examples of this pair before, and hope to eventually own a set one day. 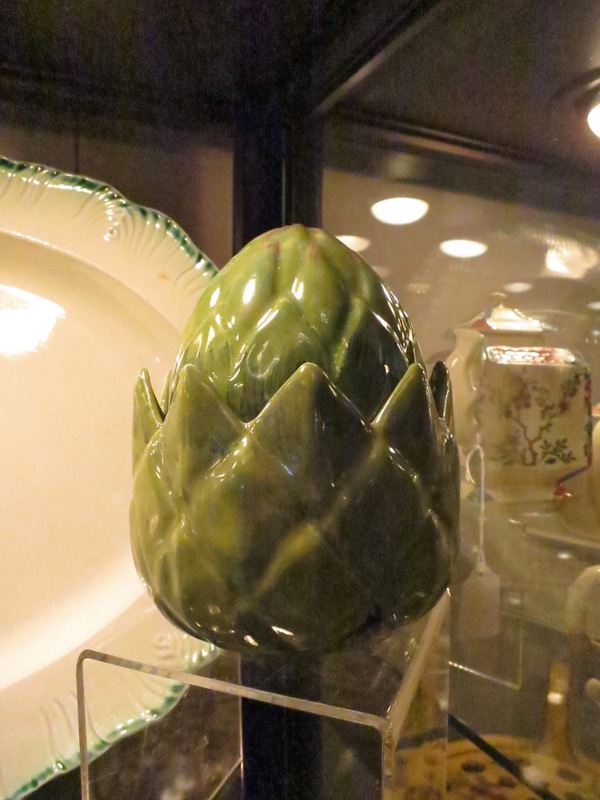 I also took a fancy to this lidded pearlware sugar bowl (at least that's what I think it is) in the form of an artichoke, made in the first quarter of the nineteenth century. 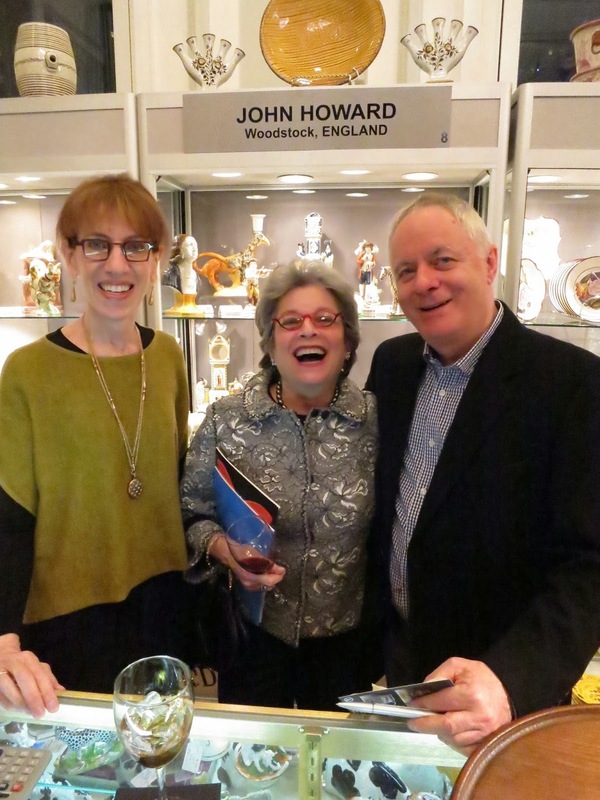 My next stop was the booth of John Howard, of Woodstock England, where I was warmly greeted by Mr. Howard and his friend Ms. Myrna Schkolne, a noted expert on early English ceramics. I didn't catch the name of the Laughing Lady between them, but I believe she may have come up to New York from Baltimore for the shows. We've bought numerous pieces from Mr. Howard over the years. The Laughing Lady was at the Ceramics Fair with Mr. Stiles Colwill, seen in the green jacket in the above photograph, who kindly introduced himself to me when he overheard me discussing Reggie Darling with Mr. Howard. I have heard many nice things about Mr. Colwill from our mutual friend, Ms. Meg Fielding, a fellow Baltimorean and the writer of the charming blog Pigtown Design. It was a pleasure to finally meet Mr. Colwill. 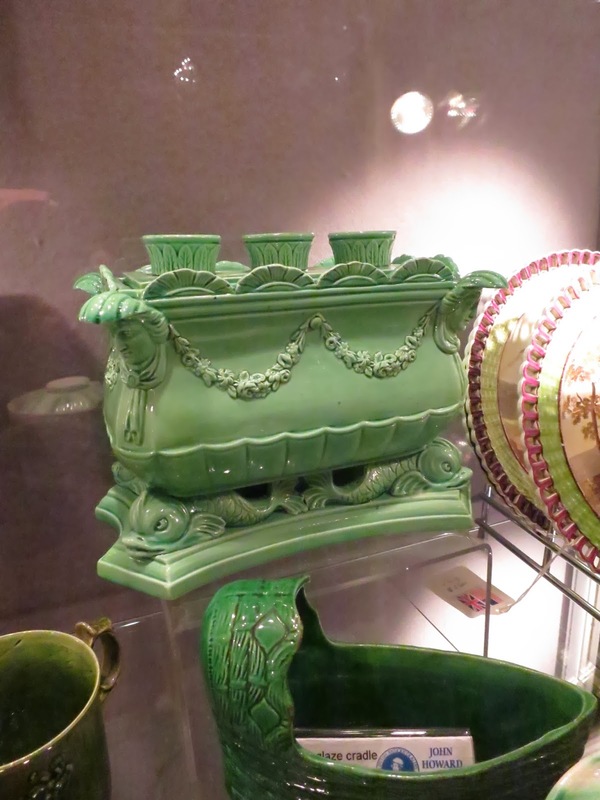 In John Howard's booth I was crazy about this green glazed creamware bow pot, shaped like a sarcophagus, ca. 1800. I was also overjoyed to see a Staffordshire figure of Jumbo the elephant, ca. 1850, similar to one in our own collection that we bought from a different dealer at the Ceramics Fair several years before. You can learn about this marvelous pachyderm in the post I wrote about buying ours here. Turning from John Howard's booth I strolled into that of Santos, of London England. I was attracted by the group of large Chinese export porcelain punch bowls on display, sitting on top of the glass display cases. I was particularly drawn to the one shown in the preceding photograph, ca. 1800, painted with Masonic emblems. Although I am not a Free Mason, I love their symbolic decorations, and have always admired Chinese export porcelains painted with them. Alas, this bowl was not to be added to my collection of export punch bowls as the proprietor of the booth was in no mood to speak with me, and became visibly irritated when I asked him if it would be okay if I took a photograph of the bowl he had on display. Ah well—I hope he will be in a better humor when the Ceramics Fair opens to the general public. Turning from the Santos booth I made my way back onto the main floor of the hall to see what else was on offer. 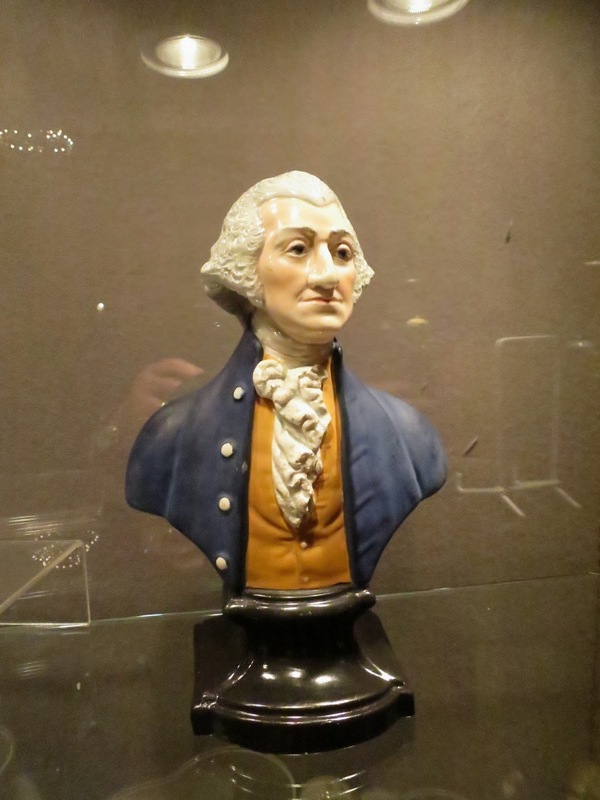 I was intrigued by this early nineteenth-century pearlware bust of George Washington, stamped 1818, from the pottery works of Enoch Wood. I already have a similar one in my own collection, but I believe mine is later, from a strike done in the 1880s or so. 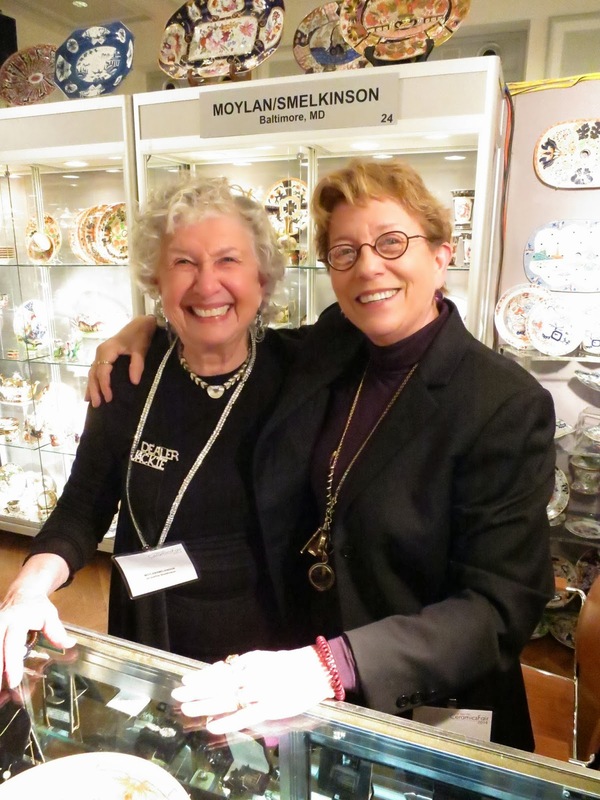 I then stopped by the booth of Moylan-Smelkinson of Baltimore, Maryland (do I notice a trend of Baltimoreans here?) to say hello to the two lovely ladies, but forgot to take photographs of their booth in my excitement in seeing and speaking with them. 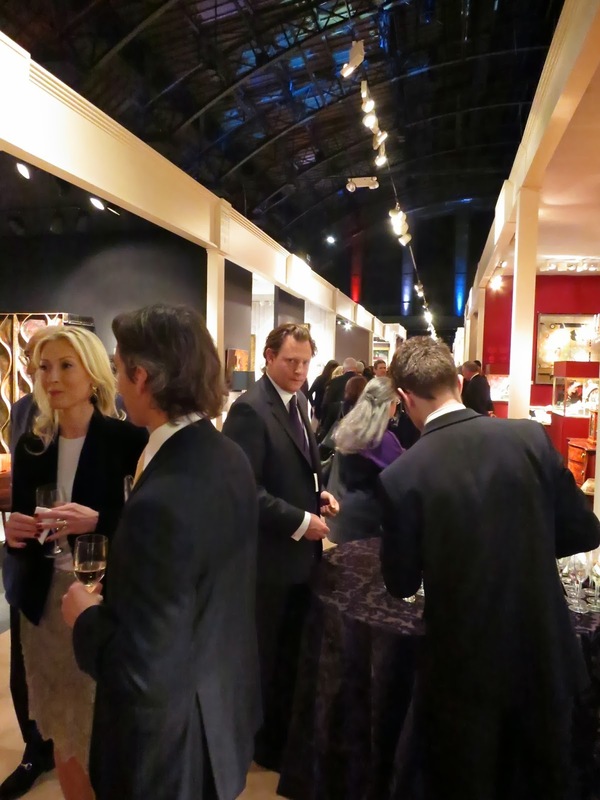 By this time I had made a full circle of the main floor of the Ceramics Fair, and so I made my way upstairs to the mezzanine level, where I was delighted to find another bar set up and a ready replenishment of my empty champagne flute. 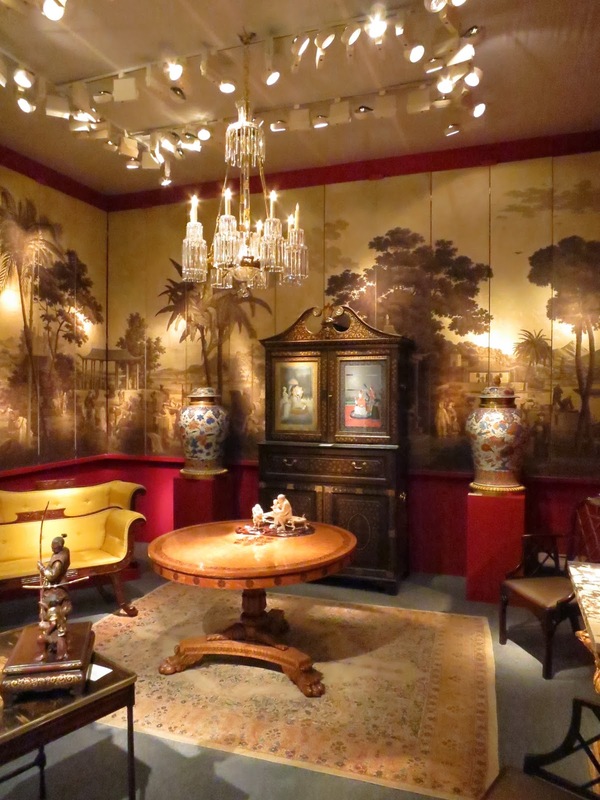 My mission in going to the mezzanine level was to stop in the booth of Lynda Willauer Antiques of Nantucket, Massachusetts. Boy and I are regular customers of Ms. Willauer's, both at shows in New York and at her charming shop on Nantucket. 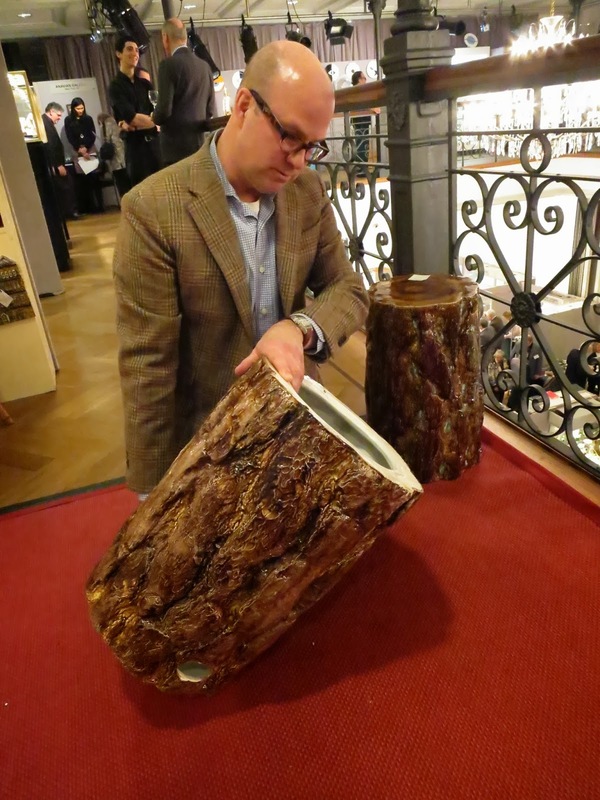 It was in Ms. Willauer's booth that I found my can't-live-without purchase of two majolica garden stools in the form of tree trunks, made in Sweden ca. 1880. Boy and I have been under bidders on similar tree trunk-shaped garden stools at auctions in the past, and we have had our eyes out for one ever since to use on our screen porch during the summer, as an occasional table. We quickly determined that we had to have them, and came to an agreement with Ms. Willauer to buy them from her. While I wasn't expecting to come away with two of them, they were sold as a pair and I am now the proud owner of not one, but two of these marvelous garden stools. Our final stop at the Ceramics Fair was the booth of Maria and Peter Warren Antiques of Wilton, Connecticut, where Boy had spied an attractive, early nineteenth century black basalt covered sugar bowl earlier during the show. 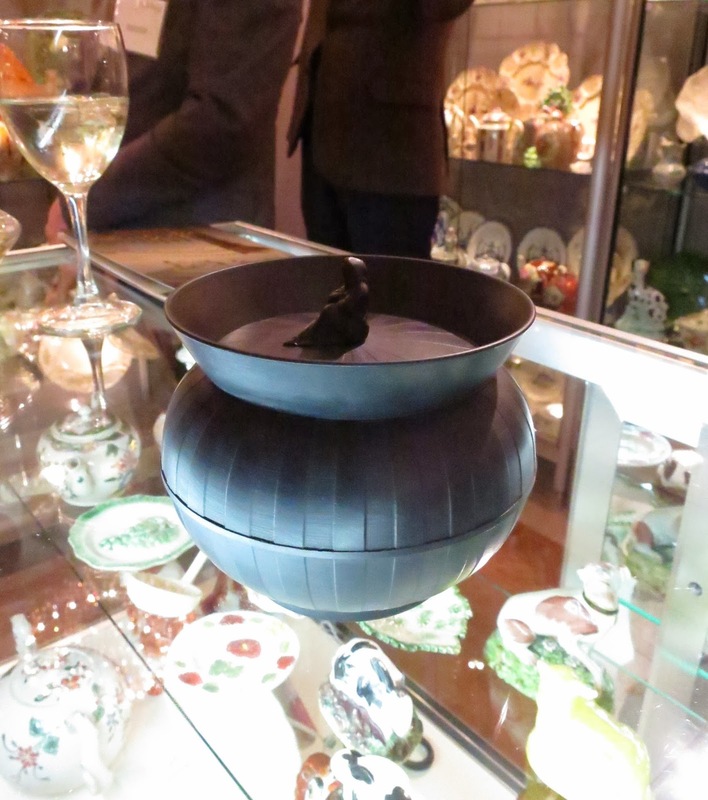 He is now the happy owner of the basalt sugar bowl, seen in the following photograph, which will join our burgeoning collection of basalt when we return to Darlington House this weekend. 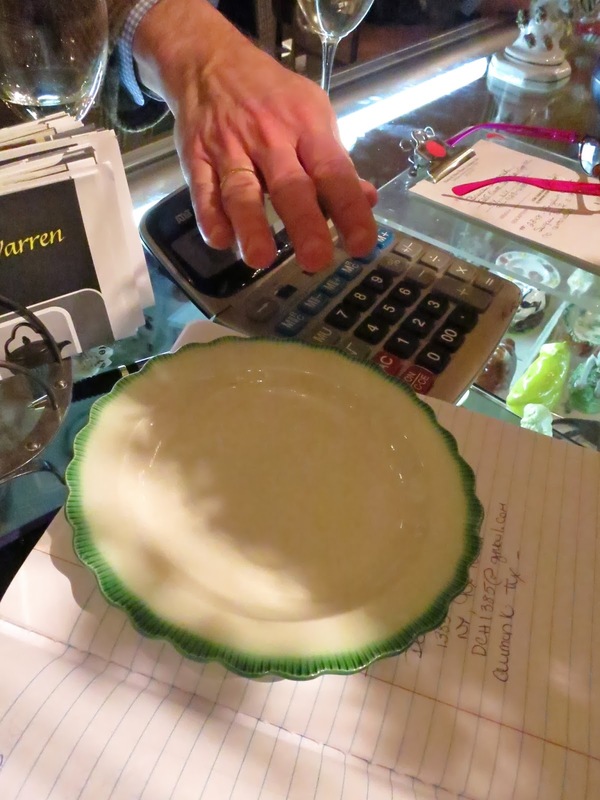 Boy also acquired a small green feather edged creamware plate from Maria and Peter Warren Antiques, ca. 1820, to add to his collection of green feather edge plates and serving pieces. With our purchases completed, we bid the Ceramics Fair adieu and headed out the door for a quick bite of dinner at the nearby cheap-n-cheerful Finnegan's Wake Irish pub. Well fortified with ceramics, drink, and food, we then braved the snowy night and walked the several blocks to our apartment building and to our dear Basil, who was snoozing away on his pillow waiting for us. 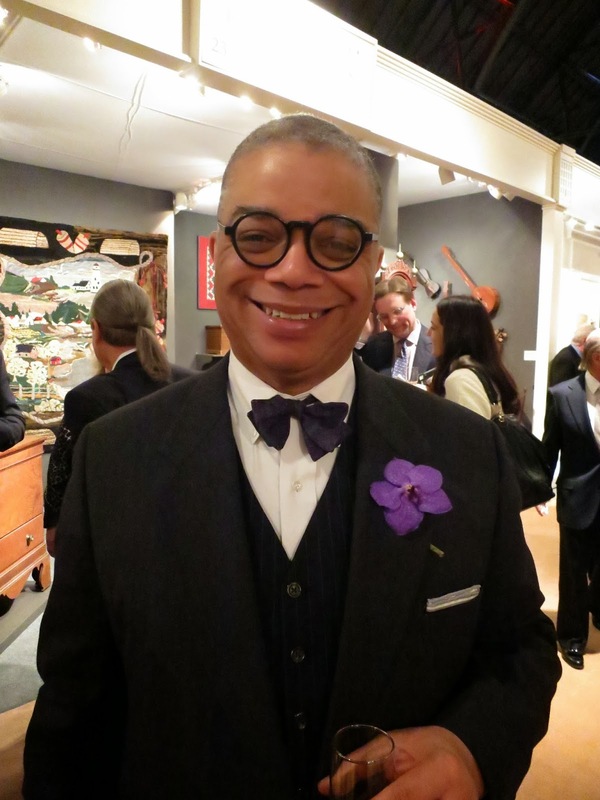 And with that, Dear Reader, Reggie's completes his reportage on this year's New York Ceramics Fair. It Is All Rather a Blur . . .